An oasis lies to the south, through the harshest desert in the world, an oasis known as the Desert Treasure. Click here to play! This oasis promises every pleasure that life has to offer, but adventurers who wish to find this place must first travel through the desert to contend with rivals who might leave them cold in the desert heat. Beautiful princesses await brave travellers who find their way to the Desert Treasure, but unmarked graves under shifting sand dunes await the foolhardy who would search for it unprepared. Maps and compasses are necessary to navigate the featureless and changing desert expanses, as well as competent guides and reliable camels. Bejewelled and golden statuettes are rumoured to be just one of the many treasures of the famed oasis, Desert Treasure. Those willing to take the risk may manage to be the first to this magical desert haven. Time is of the essence, though, as a clever traveller makes the most of when the sun is at its coolest in the day. 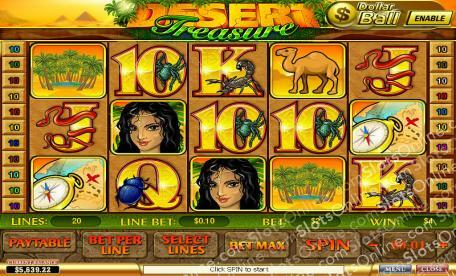 A slots machine with a wonderful desert adventure theme, Desert Treasure features a bonus game that has players choose from a number of tasteful vases in order to find the highest prizes. 3 or more princess symbols give 10 free spins. Extra money is also paid for multiple symbols and all wins except bonus wins are tripled for the free spins. The extra payout for scatter symbols is 2 times thetotal bet for 2 symbols, 5 times for 3 symbols, 50 times for 4 symbols and 500 times for 5 symbols. Golden cobra symbols are wild, for everything except bonus and scatter symbols. They can also offer higher payout for more wild symbols. 2 offer 10 times the payline bet, 3 offer 200 times, 4 offer 2000 times and 5 golden cobra symbols on a payline offers 10000 times the payline bet. 3 to 5 consecutive compass and map symbols trigger the game. In it, you choose vases that each have a prize value. Can you select the highest prizes?